RevK®'s rants: Drinking too much? What I has not realised is that my son is also abandoned - his girlfriend off to a LAN gaming event. But he has no food, and had to beg me to get him a company bike this morning so he had some transport for the weekend even... He did manage to get the cider in though. 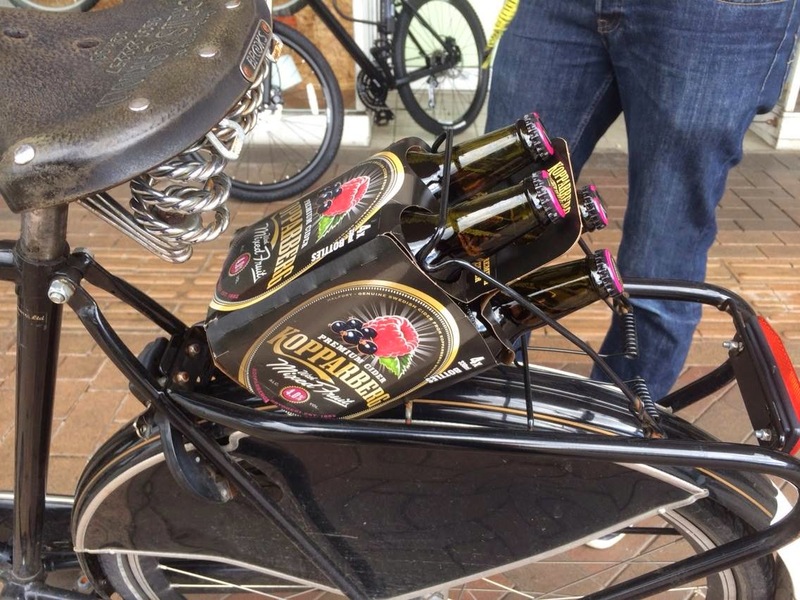 The picture is my [company] bike (the sensible one with a rack and a basket to carry cider). Annoyingly I have no whisky in, so I am trying Glayva again. I had stopped drinking it, and stopped drinking SoCo too, as both were giving me a headache. I have been googling and it seems I am not alone in this. Not these drinks specifically, but the fact that you can have drunk the same for years and suddenly find a problem with a specific drink. It is very annoying. It is not a hang over (before you even suggest it). You don't get to 50 without knowing exactly what a hang over is - not just a headache, but an overall feeling, and it is mainly dehydration and/or the effects of losing minerals from trying to combat dehydration, and not nice. But I have rarely had hang overs for decades. I am always sensible to have some water or juice before bed, and usually am fine, bright, alert and well rested after a night's sleep even after drinking silly amounts that floor others. What is odd is that specific drinks were giving me a headache a few hours later, usually meaning waking at midnight with a headache, on one side of my head, so bad I cannot sleep all night and not really starting to recover until maybe 8am. I feel grotty all morning as well, and pain killers do nothing. It seems very black and white - below a threshold of the drink I am fine, as normal, above it, I am very unwell. Though not 100% consistent - some times fine, but not often. So I had to change drinks, and ironically stronger drinks were better! Single malt Scotch at 60% ABV is fine, making for expensive tastes. I did get an optic to try and ensure I understood what levels were an issue or not. Ironically I am probably drinking less alcohol these days as a result. But I do wonder what it is - I doubt my GP will give advice other than "drink less" but it is odd. Some of the things that change as you get older are a surprise. There should be "getting old lessons" at school! Tonight I am trying Glayva as a scientific trial... If I am not well over night I'll post an update. I have not had Glayva for many months so maybe I am fine again. We'll see. Update: I had a slightly upset tummy which I had a bit during the day as well - but otherwise fine, in work just after 7, no headache, no hangover, all good. Interesting. You seem to drink things that have been meddled with. Glayva, soco, that fruity cider stuff are all sweetened with other things. I've found all of those give my those headaches. But things like Laphroaig or a good real ale and I'm fine even after as you say.. Quite a lot. I refuse to drink anything which mangles a spelling in such an unattractive way - the expression in question is “glé mhath”.